The primary source of your musical joy on the Galaxy Tab is an app aptly named Music. You can find that app on the Apps Menu, or there may be a handy shortcut right on the main Home screen. 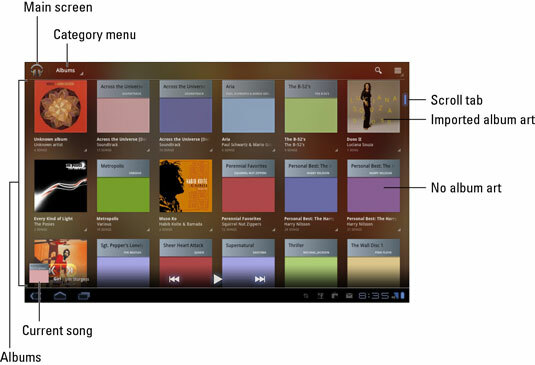 Songs stored on your Galaxy Tab are accessed through the Music app. After you start that app, you see a screen displaying album covers. If you just got your Galaxy Tab, you may not yet see any music. That’s okay, you can add music. New and recent: Songs and albums are listed in a cascade in the order you’ve imported from your computer or purchased online. Scroll the list left or right to find recent items. Albums: Music is organized by album. Choose an album to list its songs. Artists: Songs are listed by recording artist or group. Choose Artist to see those songs listed by album. Songs: All music (songs and audio) is listed individually in alphabetical order. Playlists: Music you’ve organized into playlists that you create. Choose a playlist name to view songs organized in that playlist. Included are recently played songs, favorites, and other preset categories. Genres: Audio is organized by categories such as Rock, Vocal, and Classical. These categories are merely ways the music is organized — ways to make the music easier to find when you may know an artist’s name but not an album title. The Genres category is for those times when you’re in a mood for a certain type of music but don’t know or don’t mind who recorded it. A playlist is a list you create yourself to organize songs by favorite, theme, mood, or whatever other characteristic you want. Music is stored on the Galaxy Tab’s internal memory. The size of the internal memory limits the total amount of music that can be stored on your Tab. Also, consider that storing pictures and videos horns in on some of the space that can be used to store music. Two types of album artwork are used by the Music app. For purchased music, the album artwork represents the original album. That may also happen for music copied (imported) from your computer. Otherwise, the Music app slaps down a generic album cover. There’s no easy or obvious way to apply album cover artwork to music with a generic album cover. When the Galaxy Tab can’t recognize an artist, it uses the title Unknown Artist. It usually happens with music you copy manually to your Tab, but it can also apply to audio recordings you make yourself.